Fine Gael’s youngest Deputy Noel Rock has today spoken about the urgent need to address the rental crisis, saying: “We have a serious situation here. Rents are rising to all-time record levels in Dublin. Young people who traditionally would be buying in their late 20s or early 30s are currently prevented from doing so by a dual trap of high rents and tight new mortgage rules: we need a fair deal for renters, and that’s why I have set forward the first Private Member’s Bill of the 32nd Dail last week, to get moving on this urgent crisis”. 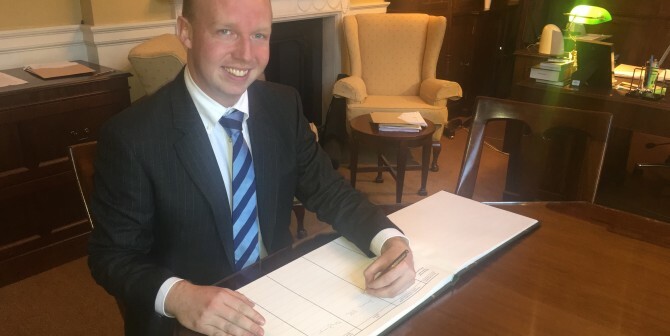 Deputy Rock explained: “My bill would be the first in an envisioned package of measures which would allow the Minister for Finance and the Governor of the Central Bank to work in a more coordinated way to ensure that the policies pursued by the Central Bank are working in the way that is intended. This alone will not be enough though, and we are absolutely going to need some form of assistance for first time buyers. Deputy Rock added: “I have written to the Central Bank Governor suggesting a mechanism to allow 70% of rent outlaid in the last three years to act as a “shadow deposit”, provided documentation can be provided showing that this has been paid on time. This, allied with a deposit, would allow renters to comply with the current mortgage rules in a fairer, more sustainable way: if you can pay €1400 rent monthly, you can pay a €1400 mortgage monthly”.